The Trouble with Cowboys Denise is hosting a fun Author Chat Party on Facebook. She'll connect with readers and give away some amazing prizes - including a Kindle Fire! < strong>RSVP today and then come back on the 11th … and bring your friends! I am a huge fan of Denise Hunter books and her latest book is another one to add to my lists of books that I love! "The Trouble With Cowboys" takes us back to Moose Creek where her other two A Big Sky Romance books have taken place. Annie is trying to work two jobs, keep her younger sister on track and help out with her nephew; however she finds herself needing assistance when her magazine column is cut and she is given a new one to write. Annie does not believe she is qualified to write this lovelorn column as she has no experience about being in love and she finally makes a deal with Dylan, a ladies' man and a cowboy. Dylan's horse is going blind and Annie is the best with working with horses, so in exchange for Annie's help with the horse, Dylan will assist Annie with her column. Annie finds her heart getting involved as she spends more time with Dylan; however he is a cowboy and they are nothing but trouble. Annie has a nice, stable boyfriend whom is a banker; however is he whom Annie can see herself with for the rest of her life? This is a great story of forgiveness, trust, second chances and finding love. Annie has issues from her past that she must face and deal with as does her sister Sierra, especially when Luke arrives in town. Dylan has a reputation; however this is just an act and cover as he has loved once and had his heart broken. Miss Lucy plays an important role in this book again as she has in the other two books as well as other past characters playing minor roles. This is a book that was hard to put down when I started reading as I fell in love with the characters and the storyline drew me right in! I also love the cover, such a beautiful fall scene! 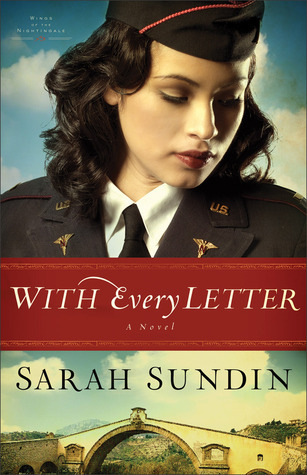 Sarah Sundin's new Wings of the Nightingale series begins with book 1 "With Every Letter" and this is a book that you do not want to miss out on! I really enjoyed Sundin's Wings of Glory series and this series is going to be just as good! Mellie enjoys her work as a flight nurse; however she feels like she does not fit in with the other girls just as she has not fit in with anyone throughout her life. Forced to try and fit in with the group, Mellie must write a letter to an officer and guessing no one will respond to her letter, Mellie is shocked when she receives a response and he understands Mellie. Tom has tried to hide from his name and his past and has never allowed himself to be his true self with others. This all changes when he pulls an anonymous letter out of the trash; now Tom can be himself as the woman receiving his letters has no idea of his name. Mellie and Tom share letters back and forth and when Mellie meets Tom face to face she knows it is he whom she has been writing to, but Tom has no idea. With these two work through their pasts and insecurities and allow their correspondence to move past anonymity? I loved this book! I was drawn right into the story and all of the character's lives. Mellie feels so unsure of herself among others, yet she is such a strong individual and more likable than she realizes. Georgie, Rose and Kay are all great characters as well whom I enjoyed reading about and the friendships that develop between Mellie and these girls. I am hoping that Kay's story is shared in a later book in this series as she is a fascinating character who puts on a front to cover up her own insecurities or her past. The details and life during World War II are fascinating as well and Sundin does a great job at bringing this time period alive. 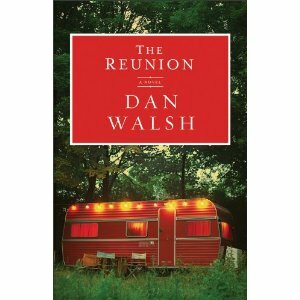 Dan Walsh's latest novel, "The Reunion," is another hit and one that should not be missed by anyone! Aaron is a Vietnam Vet and works as the handyman for a trailer park and campground. The war changed Aaron and his life in many ways, including cutting off his contact with his family and also helping him to find Jesus and have a relationship with Him. Not only does Aaron care for maintaining the park, but he also care for the people living there as well. When a reporter is hired to track Aaron down, his life changes once again and he has a chance to reconnect with his family. This book is so well-written and it is an emotional read that you will not want to put down once you start reading. This is story of so many individuals and second chances in love, relationships, life overall with mystery mixed in as well. Dan Walsh writes books that are emotional, gripping and ones that leave you thinking long after you turn the last page. 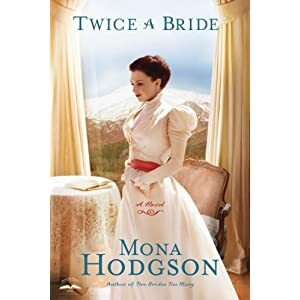 "Twice a Bride" is book 4 in Mona Hodgson's Sinclair Sisters of Cripple Creek Series and it is just as great as the earlier 3 books in the series! Willow has suffered quite a bit and dealt with a lot the past few years with losing her husband and father and being in an asylum, but now it is time to move on with her life. Willow is in Cripple Creek where her brother, Tucker and his wife Ida live. Willow is thrilled with a chance to work doing something she loves; however the man she is working with is stealing her heart. Willow is not sure she is ready for love again and if she is will things work out as planned? I loved this book! It is full of romance, twists and turns, family/sibling relationships, coping with loss and grief and characters whom I just loved spending time with! In the beginning of the story, Willow determines not to be a "Weeping Willow" any longer and she really does grow, determines to stand on her own and move on with her life. Ida and Tucker are two of my favorite characters from this series and I enjoyed reading more about them and all of the characters in this series. This is a must-read series for anyone who enjoys historical fiction! The anticipated third book in Beth Wiseman's Land of Canaan series is here! "His Love Endures Forever" is a beautiful story that has new characters and former characters whom the reader will love spending time with. An unplanned pregnancy. An absent father. Can love really endure all things? Danielle Kent is anything but Amish. But as destiny would have it, she has fallen in love with an Amish man. Now she’s 18, pregnant, and hopeful that the child’s Amish father—Matthew Lapp—will do the right thing and marry her. She knows Matthew plans to leave his Colorado settlement for a life in the Englisch world. But that plan never included a baby. When Matthew walks away from her and their unborn child, she has nowhere to turn. Her unlikely friendship with Levi offers some comfort—yet they have so little in common. This wasn’t the plan she had for her life, and she has never felt so alone. She doesn’t want to be pregnant. Doesn’t want to be Amish. Doesn’t want to trust God. God has plans beyond what her mind can imagine . . . loving plans to show a lost young woman that His love never fails but endures forever. Although this is an Amish story, all of the characters are ones that "englishers" can relate with as they struggle with many of the same things that we do - trusting God and knowing that His plan for us is perfect. Danielle does not want to be Amish and the choices that she has made result in a plan that was not what she had thought for her life. Danielle is like so many girls today, lost and seeking for that love and acceptance that is lacking in her life. She is a great main character and I enjoyed reading her story. This is an excellent story of love, trust and seeking God as well as realizing God's will and plan is perfect. Nancy Mehl's latest novel "Inescapable" is book one in the Road to Kingdom series and it is a suspenseful read that once you start, you will want to keep reading! Lizzie ran away and left her Mennonite home; however now after five years this is the only place she believes she can return to and be safe. Lizzie has been receiving threatening letters and no longer having a job she returns to her hometown and tries to figure out what to do next with her life. However, Kingdom may not be as safe as she thought it would be for herself and her young daughter. Lizzie finds herself in danger once again and is unsure of whom to trust. This is such a good book! It is filled with suspense and a love story as well and is a fast moving story that will keep you guessing at every twist and turn! Immediately I liked Lizzie from the beginning of the story and found myself empathizing with her throughout the book. As she is driving back to Kingdom and remembering various characters as well as she begins to see people from her former life face to face upon her return, I found myself wondering which ones would be true friends to her and which ones if any may be involved with the threatening notes. However, I was kept guessing throughout the story which makes for an excellent suspenseful read! I highly recommend this book for romantic suspense fans! My daughter has been enjoying eating raspberries that my dad has been picking out of my parents' raspberry patch each day. I love this time of year...the weather is changing, the air is getting crisper, the in season veggies and fruits. I remember going out and picking (and eating!) the raspberries straight from the bushes. My mom always makes raspberry bars each fall and they are the BEST! So, I thought I would share and hopefully you enjoy them as much as I do! :) My mom has been making this recipes for years as it was originally published in the August/September 2007 issue of County Woman magazine. In a large bowl, combine the flour, 1 cup sugar, baking powder, salt and cinnamon. Cut in shortening until mixture resembles coarse crumbs. Stir in eggs and extract. Press two-thirds of the mixture into a greased 13-in. x 9-in. baking dish. In a large bowl, combine cornstarch and remaining sugar; add berries and gently toss. Spoon over crust. Sprinkle with remaining crumb mixture. Bake at 375° for 35-45 minutes or until bubbly and golden brown. Cool on a wire rack. Cut into bars. Store in the refrigerator. Yield: 3 dozen. Book Review - "Taste of Home - Best Loved Recipes"
What is Taste of Home Best Loved Recipes? Taste of Home is America's connection to the personal recipes of people who cook at home as a way to bring family and friends together, particularly at the holidays. Each recipe has been evaluated and selected by Taste of Home, which ensures that it can be prepared with affordable everyday ingredients. Taste of Home is America's connection to the personal recipes of people who cook at home as a way to bring family and friends together, particularly at the holidays. Each year, thousands of people from across the United States and Canada submit more than 40,000 recipes, of which 3,000 are published. Every recipe that is published is carefully evaluated and selected by the Taste of Home Test Kitchen, which ensures that it can be prepared with affordable, everyday ingredients. Taste of Home content is available in print; online at Tasteofhome.com; in books; via digital download on iPad, mobile apps and Kindle; and Facebook, Twitter and Pinterest. Obtain a subscription www.TasteofHome.com or on your favorite digital download device. This cookibook is filled with so many great recipes! I have enjoyed going through the pages, making note of recipes I want to try (which are many!). This book is a collection of the best loved recipes that have been included in the Taste of Home magazine for the past 20 years. The year that the recipe was originally published is included with each recipe and also a comment made by the person who submitted the recipe which I love reading. This is a big cookbook and collection of recipes, but they are well-organized into different sections, so it is not an overwhelming book to pick up and try to find a recipe in. Although not each recipe is pictured, there are pictures of select recipes included throughout the book. The "Mom Made it Best" section is a great one and very useful for busy nights and days of not having time or wanting to have to plan out a meal, as the whole meal is included from the main dish to the dessert! This is an excellent cookbook as it has recipes for every occassion and meal and the recipes use "everyday" ingredients, but at the same time there are recipes when you need something just a little extra special as well! This would make a great bridal shower or wedding gift as it would be a great starter cookbook. When you order from the Taste of Home website you'll get an exclusive Taste of Home Baking Guide Free and free shipping. Come September 13th it will be released to the trade and will be available on Amazon , Barnes and Noble and where books are sold. While boys needs dads involved in their lives, they need moms just as much! Dr. Kevin Leman's latest book discusses just that! "What a Difference a Mom Makes," is a book that every mother whom has a son should pick up and read; not just read through once, but keep nearby to go to and spend a few moments in ever so often as a reminder of just how important she is in her son's life. This book is divided into several chapters each addressing a specific area. A few of the chapters include discussing one's parenting style overall and what has influenced and played into developing that parenting style, discipline techniques, and juggling and balancing all of the demands and responsibilities in a mother's life. Each chapter is further divided into sections with headings, making this book really easy to pick up and read a specific section and also easy to get as much as possible out of the book. I really enjoyed reading this book! To me it is very practical and thought-provoking. Several points I have thought much about after reading through this and it is a book that I will refer to back many times I am sure. Leman writes in a way that is easy to follow and understand and he is "talking" with me; overall his style of writing is enjoyable and understandable. I highly recommend this book for all mothers whom have a boy of their own! In Her Darkest Hours, Is He the Man She Needs? Lily Young longs to find her lost sister or will die trying. Heedless of any danger, she searches logging camps and towns, posing as a photographer’s assistant. And then she arrives in Harrison, Michigan–and the sights of Connell McCormick. Jody Hedlund is the bestselling author of "The Doctor's Lady" and "The Preacher's Bride". She won the 2011 Inspirational Reader's Choice Award, the 2011 Award of Excellence from the Colorado Romance Writers and was a finalist for Best Debut Novel in the 2011 ACFW Carol Awards. Currently she makes her home in central Michigan, with her husband and five busy children. She loves hearing from readers on Facebook and on her blog. I loved this book! Right away on the very first page, there was an aura of mystery that drew me right into the story and kept turning the pages. Lily is helping a young girl escape from the life she has been living and although this girl is not her sister, she is not giving up hope of finding her. Right away, I loved Lily's character, she is compassionate and although her main goal and focus is finding her sister, that does not keep her from helping other young girls in need as well. Oren is a great character as well as Connell; these two are both strong main characters and ones I enjoyed reading about. It is very easy to get into the story as Hedlund's style of writing draws the reader right in and it is filled with descriptions and imagery transporting the reader to the late 1800's traveling around to camps. This is an excellent book filled with mystery, romance, personal choices and decisions and characters growing! 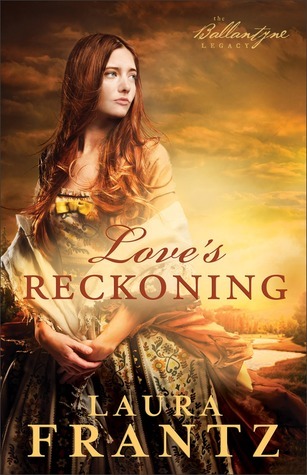 Laura Frantz' new historical romance novel, "Love's Reckoning," is the first book in her Ballantyne Legacy series and it is one that historical fiction fans do not want to miss! Silas is working as an apprentice and that is all he wants to do, work and move on. However, his master has two daughters and he wants Silas to adhere to the tradition of the apprentice marrying into the family. Eden and Elspeth both have feelings for Silas; however these two sisters are completely different from each other and may not be whom they appear to be. Silas and Eden have a connection with each other, but Elspeth is the one who is chosen to marry him. Which one will really end up with Silas and at what cost? This book will draw you right into the story and into the characters' lives. You will not want to stop reading once you start and you will cry with the characters and empathize with them on every page. This is a well-written book overall, great storyline, well-developed characters and I felt like I was actually there in Pennsylvania in the late 1700's. I am looking forward to reading other books in this series! 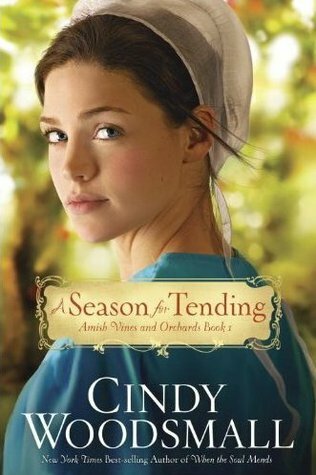 I loved Cindy Woodsmall's new novel, "A Season for Tending!" This is book one of her new Amish Vines and Orchards series and I cannot wait for book 2 to be released! Rhoda is viewed as unusual and many are afraid of her because of her abilities to grow berries and herbs and her sense that something is wrong in time of trouble. Rhoda has isolated herself and has spent time building up a successful business. After a night of partying that went bad, Leah finds herself in Rhoda's garden and although it was a bad choice, meeting Rhoda results in a way to hopefully save Leah's family's business. Leah's brothers all have issues in their personal lives they are trying to deal with as well as run the family apple orchard business that has suffered losses the past few years. Rhoda appears to be the answer to saving the family orchard, but there are so many obstacles in the way, including Rhoda's reputation, Samuel's girlfriend and Jacob's secret. As they spend more time together and a storm causing more problems for everyone, their hearts and feelings toward one another are changed as well. This book is so well-written and filled with so many characters that I fell in love with and I cannot wait to spend more time with! I did not want this book to end and there are so many unanswered questions and so many ways the story could go! All of the characters grow so much in this novel, but especially Leah and Rhoda. They are both similar to each other, yet different and they are just what each other needs as well. Leah, Rhoda and Landon make such a great team with the business as well as friends that they all need in their personal lives. Jacob, Samuel and Eli are brothers whom are working together and yet they each have their own dreams and their own personal struggles which add challenges to not only their personal lives but their business as well. I cannot wait to see what happens with starting over and who will really win Rhoda's heart as well as how things turn out for Arlan and Leah and their decisions. This is a book that you do not want to miss out on! I love trying out new recipes and I always love to look through new cookbooks; therefore I was thrilled to get a chance to review Chris Chamberlain's "The Southern Foodie: 100 Places to Eat in the South Before You Die (and the recipes that made them famous)!" This is a book jam-packed with recipes, touristy tidbits and great information, it is fun to look through and read! Thirteen states, 100 chefs, and 134 recipes later, one thing is clear: the food of the American South tells a story that spans the distance from New Orleans to Louisville, Little Rock to Charleston, Nashville to Dallas, and every city in between. The Southern Foodie explores a hearty swath of the South’s culinary culture, following its roots and exploring its evolution in the region’s best restaurants. Meet the people who are keeping the tradition alive and reinventing the flavors of the South. Swing on down to the Gulf Coast, and wade into a chef’s wonderland of fresh seafood and spicy heat. Check out the culinary creativity in the Carolinas, where you’ll find traditional smoked pork barbecue alongside Southern favorites made with fresh, local produce. Explore the restaurant kitchens of Atlanta and Nashville, where the chefs aren’t shy about fusing comfort food standards with international flair and unexpected techniques. Join Chris Chamberlain for access to the South’s best recipes and the kitchens where they were developed. The Southern Foodie shows you where the South eats and how to create those distinct flavors at home. You’re sure to rediscover old favorites and get a closer look at the delicious new traditions in Southern cuisine. Wow! What a great cookbook! Reading this book and looking through it has caused me to want to try so many recipes, but also go and visit these places! I live in the North, but went to college in Virginia and have a love for the south - the accents, the food, the beautiful places to visit, everything and this book makes me long to return there. This is really so much more than "just a cookbook" and it will be a treasured addition to anyone's kitchen and cookbook collection who enjoys Southern food and appreciates the south as well as anyone who enjoys trying out new recipes and learning the history behind places and recipes. I highly recommend this for anyone planning a trip to the South or wanting to try out some Southern cooking at home!